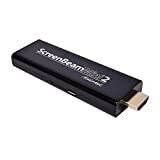 Connect ScreenBeam Mini’s USB adapter to your HDTV and you can wirelessly share your favorite online content on your HDTV. Now you can enjoy your favorite online or stored videos, photos and presentations on the best display in the house or office. ScreenBeam Mini is compatible with many devices you already own, including Windows 8.1, Wi-Fi Miracast, Intel WiDi laptops, tablets and smartphones. ScreenBeam Mini creates a direct 2.4 GHz or 5 GHz connection, so an existing Wi-Fi network is not required. Setup is takes less than one minute and is powered directly through your TV’s USB port or with a provided power adapter. Not compatible with Apple devices.